Peregrines catch anything from small to medium-sized birds ranging from finches to ducks to pigeons like Ectopistes migratorius. They catch these mainly at dawn and dusk when their prey is most active. In order to catch their prey, Peregrines dive from high perches or far up in the sky and fold their wings and tail back, making their bodies into a bullet. This “bullet” can travel up to 200 mph! 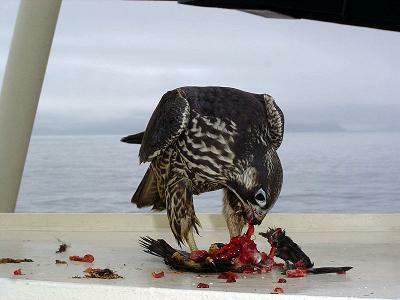 The Peregrine then hits its prey while on its dive with their feet with the resulting air pressure bursting the prey’s lungs. If the prey is small enough, it will then circle back around and catch it in the air, but if it is larger, like a duck like the Wood Duck, the peregrine will let it fall to the ground.